There is an often cited estimate that only 1 in 1000 sea turtles that hatch and make it to the ocean will survive to adulthood. With odds like that one can sometimes feel like the work is futile and has little impact. As Olivia points out in her blog this week – it just takes is one brush with success to remind us that every individual counts. 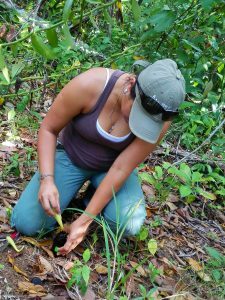 Upon arriving to Osa to start my position as a Research Field Assistant (RFA), I was so excited to start a new life that involved working in my field of study and a new place to call home. To say each category has surpassed my expectations within the time I have been here would be only an understatement. Coming from Canada, life in Costa Rica was going to be a massive change for me, however one that I was going to greet with open arms. I had my final exam for my Biology Degree at the end of April, and not two days later I was on a plane headed for my new life abroad. I finished University knowing I wanted to enter the field of conservation straight away, and am willingly missing my own graduation to do so. Ever since I arrived for my first day on the job, I have been working and learning collectively with my fellow Research Field Assistant and Program Coordinator Manuel Sanchez Mendoza. Beach patrols are done everyday, at morning or at night, and our job as Sea Turtle RFAs involves monitoring the beach for sea turtle nesting activity. Our job is to record data on turtle observations from both our beaches, Playa Piro and Playa Pejeperro. 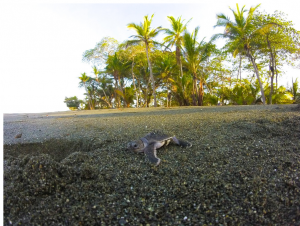 On my second day and first patrol on our longer beach Pejeperro, Manuel and I found a group of green turtle hatchlings and I was ultimately able to help them reach the ocean. I’ve come to realize that as unpredictable as the nesting turtles are, their hatchlings are just as much so. Only last week, I was taking a walk along Pejeperro in the mid-afternoon and felt something brush against my foot. 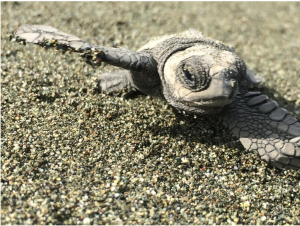 Looking down, I watched an Olive Ridley hatchling crawl along the top of my foot and shuffle as quickly as it could to the ocean – asymmetrically of course. Looking up along the sloping sand, I saw many siblings following behind. That afternoon, I was able to help around thirty hatchlings reach the ocean and avoid the majority of the scorching sun. After spending most of my time trying to save predated nests and rescue as many eggs as possible, it was incredibly rewarding to see what exactly I’ve dedicated my work here towards with the oddest timing. We just finished building our sea turtle hatchery where we relocate nests in danger of being washed away by the river or of predation. The eggs from these nests are placed carefully in our nursery to ensure safety and healthy growth. Once the babies are ready to leave, we will release them early in the morning to avoid the day’s heat and many predators. This week we have been working diligently to finish the construction and hopefully in a couple days we shall be placing our first nest in the h atchery. 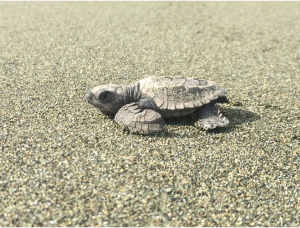 The nursery has had major success over the past two years with over 20,000 baby turtles released last year, and I cannot wait to see how many hatchlings we will have this year. Entering the field of conservation, especially sea turtle conservation, I knew the difficulty of working against so many factors and having such little chance of rewarding results in the short term. I spent some time questioning how much of a difference one person can make in conservation with so many oppositions. All of that changed though, and all it took was one baby turtle crawling over my foot! The beneficial mycorrhizal fungus found in large amounts in wild plants on Osa Verde. This fungus is one that gives several benefits to the plant. 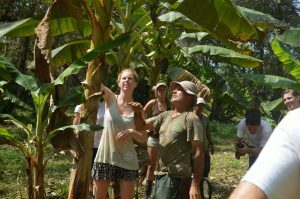 Beginning four months ago, the National University, Osa Conservation, and University of Costa Rica have been uniting forces in order to carry out the establishment and development of organic mother vanilla plants in the Osa. Since the cultivation is very profitable, it would be a good economic opportunity for the farmers in the southern part of the country, many of whom do not have job opportunities. 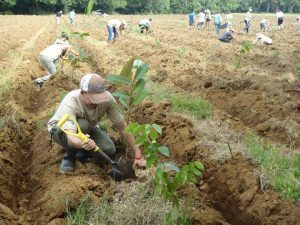 A trial plot has been placed on Osa Conservation’s Osa Verde farm. One of the problems facing the cultivation of vanilla is that of pests and diseases that affect a part or all of the cultivation. Often the use of agricultural chemicals has controlled these problems but we are undertaking a completely organic trial. Beneficial microorganisms from University of Costa Rica’s Agricultural Microbiology laboratory strains bank and other beneficial microorganism that already have been isolated from Osa Verde’s forest soil are being utilized for this trial. The microorganisms will be multiplied and evaluated in the trial. In this work, one creates an organic techno logy packet, a base of bacterias and and fungi that serve to control the pests and diseases. Additionally, we intend to provide local farmers that are interested in sowing vanilla with high quality cuttings for the plant with the desired characteristics of vanillin. These cuttings can be purchased on the market, but the sales of these species of vanilla is often of poor quality. In order for the farmers to undertake their own production and gain access to the market, both nationally and internationally, the National University will help by serving as a guide and collaborator. Develop and establish organic mother plants of vanilla, so that the farmers in the area have high quality and healthy vanilla cuttings for the establishment on their own farms. Establish a vanilla farm that is demonstrative and educational for the farmers in the southern area, where a protocol for growing organic vanilla in agroforestry systems is implemented. Determine the main phytosanitary problems present in vanilla plants found in the wild and identify potential biocontrol found in association. 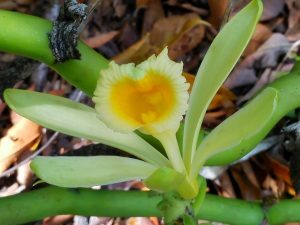 Identification of vanilla plant species that are isolated in the forests around Osa Verde. 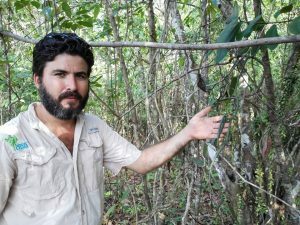 This exciting research happening on Osa Verde is just on example of how we are partnering with academic institutions and researchers to conserve the Osa and it’s biodiversity; create a sustainable and local food production system; demonstrate best practices to visitors; and also provide economic alternatives to locals. The banana is one of the most popular fruits in the world. However, since each banana is genetically identical it is highly susceptible to disease. The Osa Verde Farm is able to combat such disease by planting genetically diverse bananas, not using chemical inputs, and maintaining other sustainable practices. The banana. A fruit that we have grown to love, rely on, and ultimately take for granted may be in danger of going extinct. A seemingly incurable fungus called the Panama Disease is rapidly spreading to plantations around the world and wiping out the banana crops there. Despite the fact that there are thousands of varieties of banana worldwide, more than 95% of the bananas produced for export and over 40% of bananas total are the Cavendish variety. The Cavendish is the variety that we are all familiar with. This variety is tailor-made for export. Not only is it mildly sweet, soft, and seedless, but it also continues to ripen after being harvested and has a thick skin that makes it both cheap and easy for companies to transport. However, in order for the Cavendish to remain consistently viable for export, each is a clone. This means that there is absolutely zero genetic diversity within the beloved Cavendish. Additionally, strict monocrop agricultural techniques and lack of crop rotation make the Cavendish extremely vulnerable to threats such as the Panama Disease and pests. Genetic diversity within a species is usually nature’s defense system against these type of threats, as it allows the organism to adapt to new and changing threats. However, with human intervention and domestication, that first line of defense no longer exists. Because the Panama Disease is a fungus, it stays in the soil and infects the plant through its roots. Because each banana plant is biologically identical, the plant itself is defenseless. The Panama Disease has the ability, and often succeeds, in wiping out entire plantations. Then, the fungus stays in the soil for years after, making it difficult to plant a new crop. Additionally, there are multiple variations of the Panama Disease spreading around banana-producing countries. One such strain is called Tropical Race 4, or TR4. Panama Disease and TR4 are currently most prolific in South Asia, the Middle East, Africa, and Australia; but it’s spreading. Randy Ploetz, Professor of Plant Pathology at the University of Florida has called it the “worst threat to sustainable banana production worldwide” and noted numerous social and economic implications in the collapse of the banana industry. Believe it or not, this is not the first time that the world has seen such a pressing threat to its favorite variety of banana. The Gros Michel is the sweeter, more-easily transported equivalent of the Cavendish and it practically went extinct in the 1960s when a fungus similar to the Panama Disease attacked it as well. In fact, the Cavendish is a hybrid banana, bred for its fruit and immunity to the fungus that plagued the Gros Michel. Why is history repeating itself? While the fungus has, over time, continued to evolve and change, the Cavendish has remained genetically exactly the same. In effect, the Panama Disease and the banana are playing an evolutionary game of “Tag”—and the Cavendish is “it”! In order to keep the Cavendish alive, banana companies have to use a huge amount of chemicals including pesticides, herbicides, and fungicides to keep threats at bay. Ultimately, there is a limit on the effectiveness of even the most toxic chemicals– not to mention the detrimental impact of the chemicals themselves on both those consuming the bananas and the environment around the plantations. Banana companies have a long and dark history of exploitation and big business around the world and especially in Costa Rica. Despite the fact that Americans annually consume more bananas than apples and oranges combined, there are surprisingly few regulations governing human rights issues in banana production. Historically, the industry is notorious for its use of child labor, anti-union measures, substandard pay for workers, and exposure of workers to harmful chemicals. In response to the big banana businesses, smaller-scale companies have cropped up; making the commitment to use fewer chemicals, treat workers fairly, and protect biodiversity. Osa Conservation is doing just that! On the Osa Verde farm, we are committed to mastering the art of sustainable farming and teaching it to others. Rather than grow the now-popular variety of Cavendish, our team is growing the previous favorite, Gros Michel without chemical inputs. If the Gros Michel is also susceptible to fungal infections, how is it growing in the Osa? And with no chemicals? The small-scale agricultural practices that are utilized at Osa Verde allow our talented agronomist, Paola Vargas, to focus her attention on keeping the plants healthy. According to Paola, preventing too much moisture and removing old leaves are some simple yet labor-intensive things that keep the bananas safe and the farm running without the input of chemicals. Osa Verde is committed to maintaining the farm organically — and according to Paola, it’s not as difficult as it seems. As long as the plants get the proper nutrients, then the farm is stable. The farm requires constant maintenance, but no more than an industrial farm working with a delicate balance of toxic chemicals. 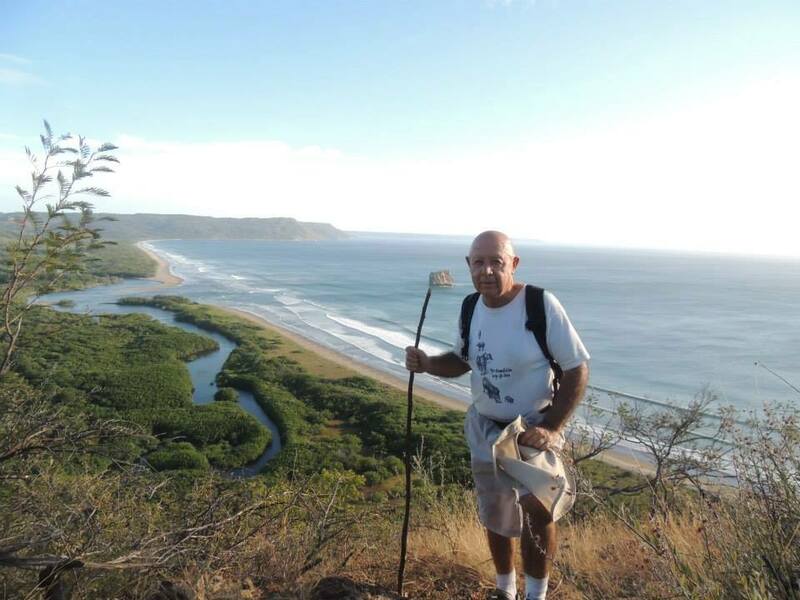 Osa Verde has a group of 4-8 people that are responsible for all of the work on the farm including planting, harvesting, maintenance, and any other tasks that may arise. The work being done here has huge implications for the future of sustainable agriculture. The Osa Conservation team works in the hopes that people around the world can learn to make more sustainable choices when it comes to responsible food production, healthy food, and food security around the world.